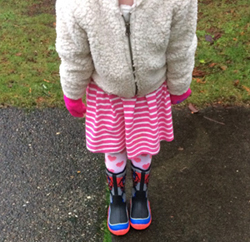 Recently I was given a chance to review some boots for my daughter. Talk about great timing, since the wet and rainy Vancouver was upon us, and my girl had grown out of her previous season’s boots. However, to my surprise, she instead went with the Transformers option – in the Optimus Prime style! These boots are great. They’re so versatile – perfect and durable in the rain, but providing the stability and ergonomics for the foot much in the way that a running shoe does. And even better is that we had a chance to test them out in the snow recently – upon which we realized that they kept my daughter’s feet very warm and dry after playing for a few hours in the snow! Let me tell you, she was a real hit at school when all the kids in her class saw her cool new Transformers boots! Score and extra point for mom over here when my daughter learned that I was a Transformers fan when I was a kid, too! The MSRP for these boots is $69.99 and they range in children’s sizes from 7 to 13, and youth sizes from 1 to 5. These boots are awesome, and I would highly recommend them – in fact, I’m looking for a pair for myself next!The Muck Boot Company has boots for all types of activities – from cold weather trekking, to horse and stable, to work boots and play boots for kids. Visit www.muckbootcompany.com for more information.